ZIMBABWE – FORMER Vice-President Joice Mujuru has reportedly turned down a government pension and retirement benefits offered to her by President Robert Mugabe, claiming she does not want to be politically tied to Zanu PF, an indicator she could be ready to return to mainstream politics. Mugabe three weeks ago gazetted pension and terminal benefits for former Vice-Presidents in a move widely believed to be aimed at “politically containing” Mujuru, who has been linked to a new political outfit, People First, which comprises ex-Zanu PF members. Contacted by NewsDay yesterday Mujuru cryptically said: “Thats water under the bridge, nothing to tie me to anything.” She declined to elaborate further. But her close ally,who declined to be named, said: “For her, the issue is on principle. She is not concerned about material benefits but the dignity that has been removed from her as a woman and a war veteran. Sources close to her said she had spurned the offer as she feels “it’s meant to tie her down to the Zanu PF political clique”. “She is of the belief that the terminal benefits that were publicised could be politically motivated and also because of the manner in which she was removed from office, she did not resign or retire, but was fired,” the source close to her said. “Hence, getting the package would be wrong morally. Moreso, the manner in which the President has allowed his wife (First Lady Grace Mugabe) to continue talking about her and her late husband (ex-army general Solomon Mujuru) – makes it difficult for one to accept the offer even if it’s genuine.” The offer came eight months after Mujuru was booted out of both government and Zanu PF together with more than 140 top party officials on allegations of plotting to kill Mugabe. was bound to have implications on Mujuru’s political life, had among other things, a domestic worker, a gardener, two drivers, a private secretary, a close security unit officer, two aide-de-camp officers, an office, a Mercedes Benz vehicle and a colour television set. 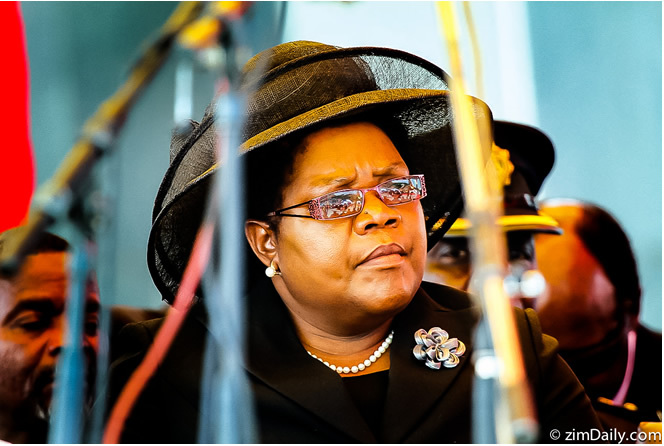 The law states that Mujuru would lose her terminal benefits if she were to be employed privately or as a public official and the rejection of the pension could be indicating she is plotting a return to public life. Political analysts yesterday said Mujuru’s snub of the pension offer could have been driven by emotion and her desire to send a message that she wants to remain independent. Since her unceremonious exit from the political limelight, Mujuru has continued to be on the receiving end of relentless attacks from the Mugabes. Recently, Mugabe told party supporters that the late army General Solomon Mujuru,who died in a mysterious inferno at his Beatrice farmhouse in 2011, had plotted a palace coup. Mujuru has, however, denied the allegations of conniving with her late husband to plot Mugabe’s ouster, but has kept her future political plans close to her chest, fueling speculation that she could be plotting to spring a surprise in the 2018 elections.